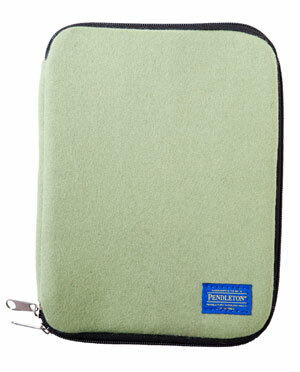 I love the wooly outside of this pouch, but the inside ... very cheaply constructed. I bought it for myself as a treat a few months ago. Sine then, one of the interior zipper tabs has fallen off the zipper and one of the two zippered pouches is completely pulling away from the cover (there was almost no extra material sewn into the seam). Really shoddy assembly. And like one of the other reviewers wrote, it's a bit like a wet noodle to begin with - the case is very soft and bendable - I store mine with a piece of cardboard inside. It's really too bad because the exterior is lovely. NOTE FROM KNIT PICKS: I am sorry to hear that your needle case is coming apart. Please contact our Customer Service at 1-800-574-1323 and we will be happy to take care of that for you. 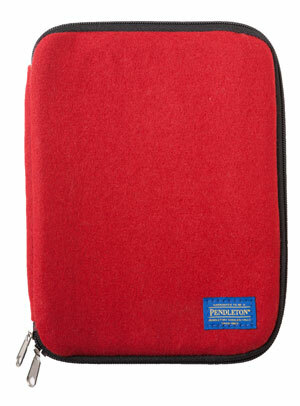 Im sitting here rubbing my beautiful red Pendleton needle case. It holds everything. My interchangeables, my dpns, all my cables, my notions and anything else i might think of. Its so pretty. So soft. All my life I wanted something from this company Pendleton. I could never afford anything until now i found this beauty from the clearance items here at Knitpicks. You guys made me so happy. Love this case. Very soft exterior - love the wool felt, perfect natural material for a knitter. The flip in the inside has needle compartments on both sides, which fits all of my Options nickel-plated interchangeable circular needle tips. 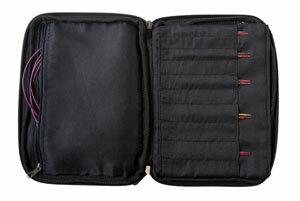 The front and back covers each has a large compartment for notions - I put my interchangeable cables, measuring tape, stitch markers, tapestry needles (in a tube), cable needles, etc in there. All of them fit and the case doesn't even look bulky. Very well-made and practical. 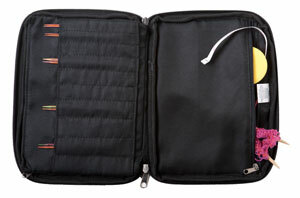 Compact and flat for travel - it condenses my multiple zipped bags into just one case! Would buy a second for my crochet hooks, but they barely fit, flushing almost to the zipper. I wouldn't mind buying one just to have it... It's so soft to the touch and cuddly. I got the grey! I love it! I waited until I had time to use it a while before I wrote a review. But I'm sure that I'm very happy with it. 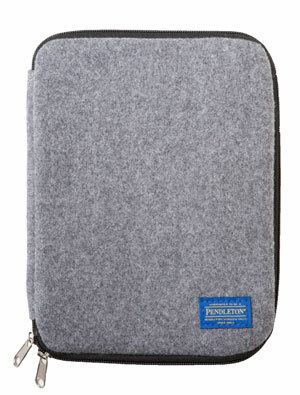 I love the wool fabric it's made of, and the organization of the interior. It makes me feel like I have a fine thing when I hold it. All my knitting tools in one small case! It wasn't 'til I'd ordered this that I read the description more closely and thought I'd really slipped up. I wanted this to put my set of 6" DPNs in and this says it fits up to 5". Oops. Never mind, I thought at least I'll still be able to store my crochet hooks in it and that will keep them all in one place. Well, wasn't I pleasantly surprised when it arrived (in under a week, I might add - excellent shipping from US to UK folks) and I had a go, only to find that my 6" DPNs *will* fit in the case and the case will zip closed with no trouble. So now, not only do I have all my crochet hooks in one place, I have also put my entire set of KnitPicks DPNs (2.00 - 3.25mm), but I've also got room in the 2 zippered pockets to put a variety of accessories (like end caps and needle tags, etc) in the two zipped pockets and it closes easily and with no unsightly bulging. I couldn't be happier with the case.